Additional Flow photos are now available here, showing spray pattern and stream quality. As mentioned below, each flow photo was shot with the shower head's 2.5 gpm flow restrictor installed, using a medium system supply pressure of 60 psi, and using only the cold side of the water supply to reduce steam in the photos. This means you can expect to see the same high quality streams in your shower! Flow photos of all shower heads are now available here, showing spray pattern and stream quality. Each photo was shot with the shower head's 2.5 gpm flow restrictor installed, using a medium system supply pressure of 60 psi, and using only the cold side of the water supply to reduce steam in the photos. This means you can expect to see the same high quality streams in your bath! 1) Stream Integrity: Do the streams of water stay cohesive with a precise, uniform and symmetrical flow or are they inconsistent, random or even colliding? Are there renegade streams plotting their own courses? Does the stream pattern stay the same at very low water supply pressures? 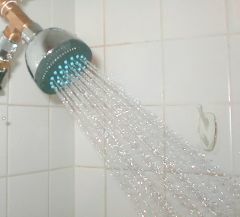 2) Flow Efficiency: Does the shower head convert all the available water supply pressure into shower head pressure? This is particularly important in low water pressure areas. 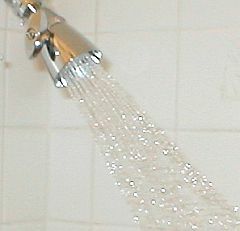 3) Spray Dispersion: Does the shower head spray stay focused or does it disperse at a wide angle? Powerful, soothing shower heads will excel in each measure, not just one or two. 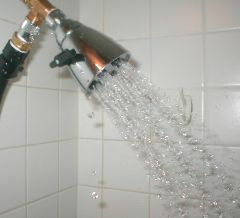 A garden hose, for example, would have an extraordinarily high flow efficiency but provide a lousy shower, while many shower heads have the proper spray dispersion but provide poor flow efficiency. Of the three measures, the first two are the most important and very few heads perform well in both these measures. Measuring flow efficiency and testing the integrity of the streams at various lower pressures requires special test equipment. We developed this testing criteria with the goal of measuring shower head performance in an objective way that exactly matched the practical but subjective measure of how strong and powerful the streams feel in the shower. After much trial and error, some head scratching and several equipment redesigns, we arrived at our current methodology. From the same test, the pressure gauge shows this awful stream is coming out of a shower head getting a full 60 psi. That's unacceptable! This photo shows the regular Ultimate. Basically an identical pattern to the Large Ultimate, as you would expect - defined, symmetical and precise, but with fewer streams resulting in slightly greater pressure per stream. Remember that with all our High Pressure Shower Heads these basic stream patterns remain intact at pressures as low at 20 psi! (Normal is 60 psi and very few areas are below 40 psi) The pressure of the streams will drop under these extreme conditions, of course, but the stream integrity is preserved. 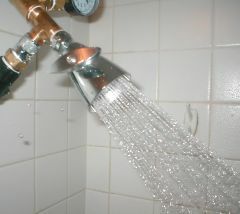 This photo shows the stream integrity of our Perfect shower head (old style). Very similar to the Large Ultimate. Again you see excellent definition, continuous streams of small drops, no renegade streams and no pressure-robbing collisions. We have developed our own system to be able to reproduce most conditions and any test pressure from 10 - 80 psi. Our standard testing begins by measuring a shower head's performance in the three key criteria (stream integrity, flow efficiency and spray dispersion) at 60 psi, the most common water system pressure in the United States. Then we examine the shower head's performance at 40 psi, to duplicate a typical low-pressure water supply system, and finally we torture test it at an awful 20 psi. Most shower heads only dribble at 20 psi. The best-of-the-best can maintain stream integrity at extremely low pressures. 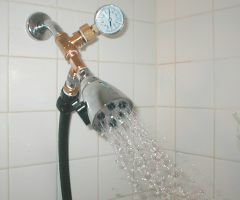 This testing isn't just so that we know how well a shower head will perform under a dreadfully low pressure like 20 psi, but it is also a fantastic indicator of which shower heads will perform great at normal pressures. Finally, we combine the measurements from the 20, 40 and 60 psi tests and determine the overall rating. 1) Too few households have water supply pressure at 70-80 psi for the information to be very useful. It would be the equivalent of reading about a new sports car that was tested using high octane racing fuel. Sure, it performed great in the test, but what about when I put 87 octance in it and turn on the air-conditioning? The tests need to be real-world and applicable to a high percentage of likely users. 2) Many municipalities are now standardizing on 60 psi. Some cities with the ability to supply a higher pressure than 60 psi are choosing to reduce the pressure to the 60 psi standard. 3) The lucky folks with 70-80 psi water supply pressure probably aren't looking to our website for help. They're probably in the shower.